Aridity does not seem to be a major gardening problem in England, although some parts of the realm during my visit were experiencing what the English were pleased to call a drought, despite days of rain. Water levels in streams and ponds, I was informed, were disconcertingly low. Xeriscaping or xerogardening is a method of gardening which responds to the scarcity of rain and does not rely upon extensive watering by irrigation systems. Xeriscaping favours water-hoarding succulents like cactus, yucca, sedums, or drought-tolerant plants like sage, coreopsis and yarrows. Ideal gardening for desert-like conditions in Nevada, Arizona, and parts of the Canadian prairies. Curiously, from the moors to the South Downs, from East Anglia to Cornwall, I didn’t come upon much in the way of arid gardens, or xeriscapes, in whatever form. They must exist in England as many gardeners are an inventive lot, and usually don’t let climate prevent them from attempting the difficult or unusual. 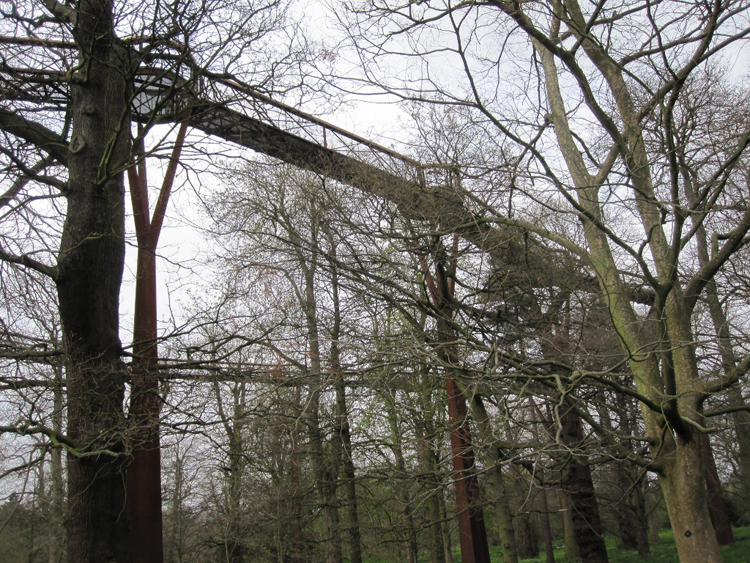 Strolling back and forth on Kew’s Xstrata Treetop Walkway, becoming less anxious the longer I exposed myself to the elements, impressed by the horse chestnut, the silver lime (although not in aromatic flower), and the chestnut-leafed oak, I recalled with considerable pleasure the genius of gardeners. Confronted with a seemingly daunting task, visualizing possibilities, in some cases marrying engineering with horticulture and sustainability with vision, they often produce breath-taking results. 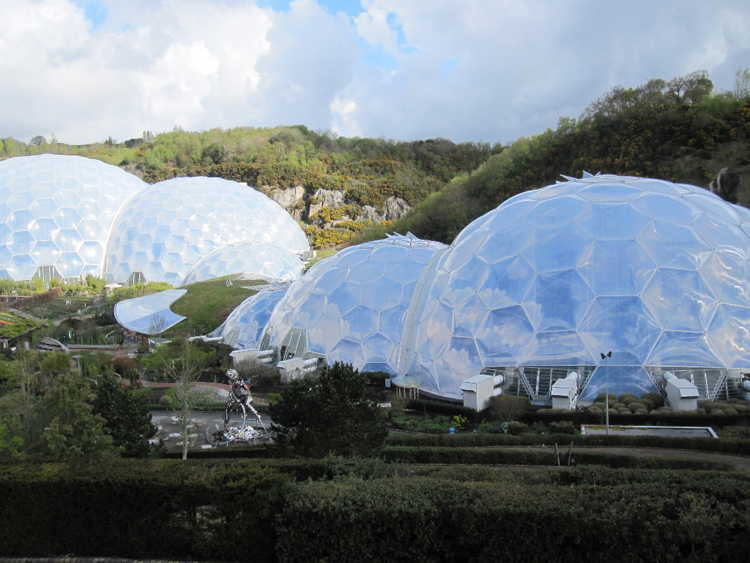 I remember the Eden project, a nerve-wracking bus ride from Saint Austell in Cornwall. Some of you may be familiar with the county’s hilly terrain, narrow roads, and the competent, rather daring drivers. The first view of the Project confirms expectations and leaves one gasping. From the height of the bus, I looked down into a valley of biodomes, terraced gardens, and metal sculptures which suggest a futuristic colony on Mars more than an English garden. In this instance, the word garden is an understatement. For here, biomes to use the correct term, simulate tropical, Mediterranean, and other climates, display plant life of the respective zones in massive array, and demonstrate the complete transmogrification of a once devastated land. 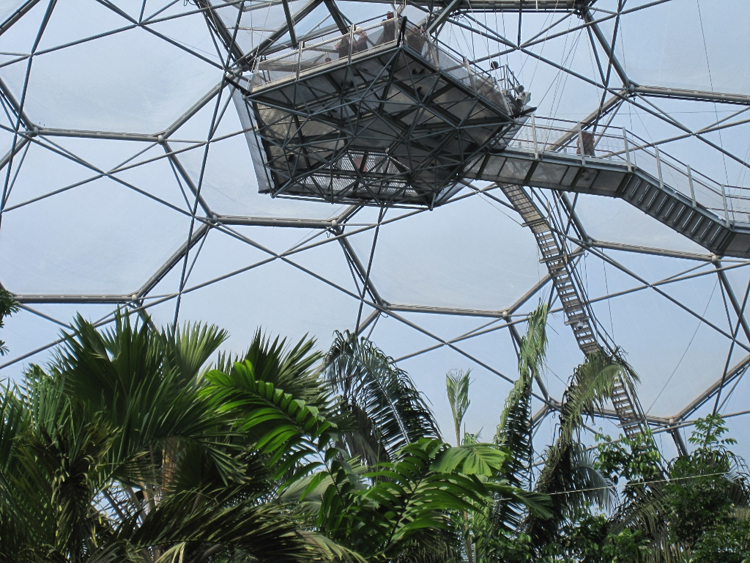 The tropical biome is fascinating, if increasingly uncomfortable, because one walks, saunters, then trudges through a humid and hot equatorial forest, all contained within the phenomenal dome, reminiscent of Buckminster Fuller’s biodome at Montreal’s Expo. It must be fascinating because a gaggle of teenaged tourists scurried from one enormous plant to another, endlessly snapping pictures on their digital cameras or iphones, and not once reading the signs or actually looking at what they saw. The Eden Project is a veritable heaven of ingenuity and botanical productivity. The cafeteria serves natural food grown on the premises, prepared without herbicide, insecticide, or artificial additives. Quite healthy and tasty. The homemade bread is superb. What was once a dead lime stone quarry, a great gouge in the landscape, has been resurrected into fertile fields, mind-altering biomes, horticultural learning centre, and astonishing experiment in green community living. Aside from necessary funds, restoring a landscape or great garden requires patience, understanding, knowledge, and a good helping of genius. Gardens, unlike pyramids or palaces, can disappear through neglect, financial collapse, or death of original maker. They are often staked to the fortunes of the families. Plants, except for cacti or trees, do not live for generations on end without regular attention and unfailing love, and ready cash. Gertrude Jekyll, for example, a major gardening practitioner and theorist of the late nineteenth and early twentieth centuries, employed the services of the architect Sir Edwin Lutyens to help design her great gardens which perished after her own death. Influenced by John Ruskin, she also applied the principles of the Arts and Craft movement, theories of colour, an understanding of how plants change and grow, their relationship with each other, the connection between house and gardens, complementary colours, and in so doing created remarkable perennial beds on her Surrey estate. After her death, the gardens languished, and her property passed into other hands; but they have since been restored according to her original plans, and visitors are welcomed. Sadly, I did not see Munstead Wood, Munstead also being the name of a lavender cultivar, but I did see the results of another magnificent restoration, also in Cornwall, the Lost Gardens of Heligan. Most anything lost and found immediately arouses curiosity. In a sense, a garden cannot be lost if the land has not been paved over, for even a lost garden will retain something of its original nature, some outline, some unearthly sense of its past beauty, and promises of great things to come, if attention is paid. The search is worth the digging, and Heligan delivers in spades. Like the Eden Project, Heligan can also be reached by bus ride from St. Austell. Founded in the eighteenth century by Henry Hawkins Tremayne, the Heligan gardens developed by succeeding generations of the Tremayne family over the next hundred years or so achieved its fullest glory before the First World War. War distracts attention from art and gardens. 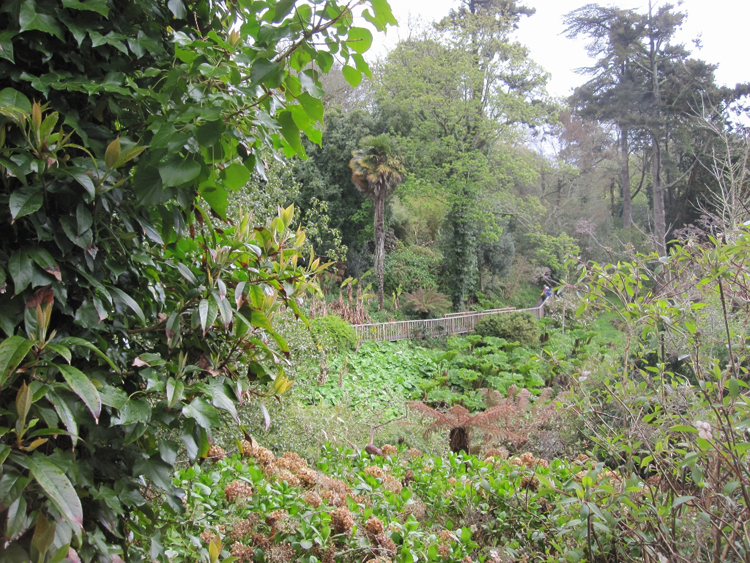 Heligan declined, fell into dereliction, was buried by overgrowth, disappeared from consciousness, then was rediscovered by John Willis, a descendant of the Tremayne family, and his friend Tom Smit in 1990. Originally covering a thousand acres, Heligan benefits from a subtropical microclimate in a Cornwall valley that has allowed pineapples, bamboo, palm trees, banana plantations, and arguably the world’s largest rhubarb, to flourish. 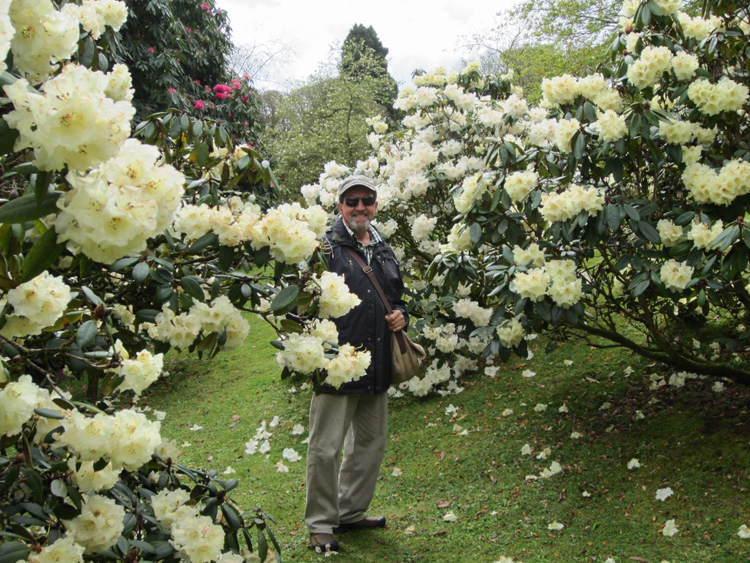 Despite the loveliness of the refurbished Italian and other gardens, not least of which is the gorgeous stand of rhododendrons, the Jungle garden alone is worth the visit. A raised boardwalk safely allows viewers to stroll among jungle growth over several ponds in a steep valley, somewhat reminiscent of the Sunken Garden in the Butchart Gardens near Victoria, British Columbia. The jungle garden of Heligan is a testament to those hardy Victorian men and women who travelled abroad, intrepid is the word often used to describe them, and who took artifacts, cuttings and plants from foreign countries without interference, and shipped them home. Great gardens can be like museums in that respect. Oh yes, while there, you must take the woodland path and look for the marvelous Mud Maid, a forest floor sculpture by Sue and Pete Hill. This is the kind of man that young men of my generation and perhaps a younger generation must have wanted to be, especially young men who wanted to write. Graham Greene, The Comedians (NY: Viking, 1965) is available from Abebooks.